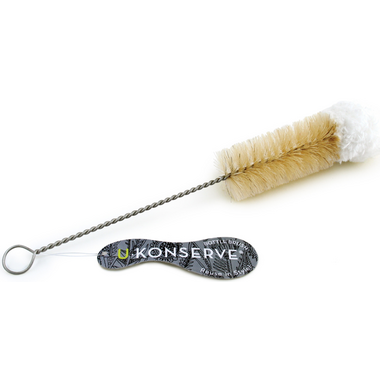 Extend the life of your reusable stainless steel bottles when you use this U-Konserve Bottle Brush for thorough yet gentle daily cleaning. The soft tip and durable scrubbing bristles reach hard-to-clean bottle interiors. Use with all of our stainless steel bottles. Cleaning Instructions: Dishwasher safe, or hand wash and hang on loop to air dry. It's just okay. Doesn't fit the tight bottle I bought it for, but using it for other water bottles etc. The cotton end will not last long and dirt particles seem to stick to it too easily. Brush works well for cleaning S'well bottle. I also use it to clean my baby's bottles. Works great, only wish it was a bit smaller to clean some kombucha bottles that I like to reuse but otherwise no issues. This works really well on my reusable water bottles and travel mugs. The end is a really dense material rather than a foam or plastic. Big improvement on the one I replaced. Love this brush! I use it to clean my S'well water bottles and it's perfect. Great for travel coffee mugs too. I love this bottle brush. I wish it came in a smaller size, too. The brush part is great for cleaning. I do wish the metal rod was a little stiffer as it bends when trying to clean taller water bottles. I don't feel as confident that the bottom of the bottle is getting scrubbed. I am pleased with this brush. Does an excellent job ! I had not realized that the end of it was a fabric. Wondered how I would like that, but it is actually great ! I give it a good hot rinse when done, squeeze out the excess water & leave it on the drain board (upright) so it can dry before I put it away. That way it stays fresher . I have been using this brush for a couple weeks now. It's held up very well. I find it does a great job in baby bottles, small cups, and bigger bottles or jars as well. I find it best to squeeze the water out of the cotton when you are done, as it gives it a chance to dry out between uses. I hope it lasts a lot longer than the traditional all plastic brushes I had been using before.